At last! Thanks to Captain Groovy, who kindly sent me the lost files, we can now switch from the East to the West, right to where it all began: Liverpool! Of course, the first thing springs to mind is the Beatles… certainly unique but not alone.Their sense of melody, drive and enthusiasm was a slap in the face for most early teenager bands. A song like "I should have known better", while still rooted in Rock 'n' Roll and in the Beat sound, was moving boldly forward in a then unknown direction. It served them well and triggered a world musical revolution: bands changed their names, revamped their looks (moptops now compulsory) and started paying attention to lyrics, arrangement and melody. It was that or the assurance of not having screaming girls at your gig… an easy choice. This also signalled the end of the surf band and the start of the long lasting rivalry between "Pop" (Beatles) and "Rock" or blues-influenced bands (read Rolling Stones influenced). It is also the start of the first universal fad and did it spread! 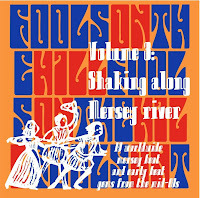 From Iceland to South Africa, from Canada to Australia, you'll find here 19 choice cuts of the Mersey sound, done by the best "Dedicated Follower Of Fashion"… The Kinks had it in for the Beatles (did someone says jealous?). Thanks again to the Captain for his help. Take the ferry 'cross the Mersey here! A great mix, I thoroughly enjoyed listening to it. This is one of my favorite types of music and you definitely picked a great bunch of songs. I'll be playing this one a lot! I hope you'll consider putting another one of these together. I know it's a lot of work, and I want you to know that your efforts are appreciated. Thank you! The link for this volume is dead. Anu chance of getting it re-upped. please? Great series!! I'll try to re-up it but it probably won't stay there too long. only this one is dead !